The dashboard has been completely updated with new graph stylings for each function. 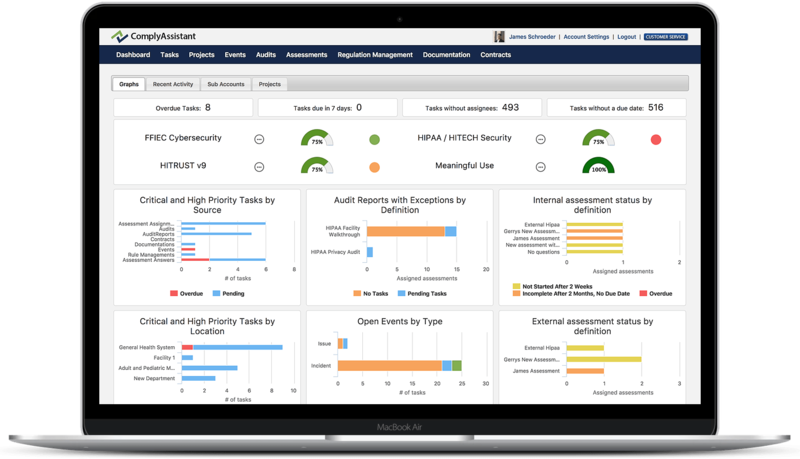 We have recognized the need for exception management within our Dashboard graphs and completed our redesign with this in mind. The ability to assign multiple locations to a contract is now available within Contract Management. A “Select All” choice is now available under the Category and Sub Catagory filtering options. A new version of ComplyAssistant Mobile has been released. Make sure to complete the application update on all Android and iPhone devices. The audit report graph entitled “Findings by type” has been duplicated at the audit definition level to provide a roll up of information across audit report findings. This graph will update when its corresponding filters are chosen. Regulation progress indicators have been added to the regulation management graphs on the dashboard. 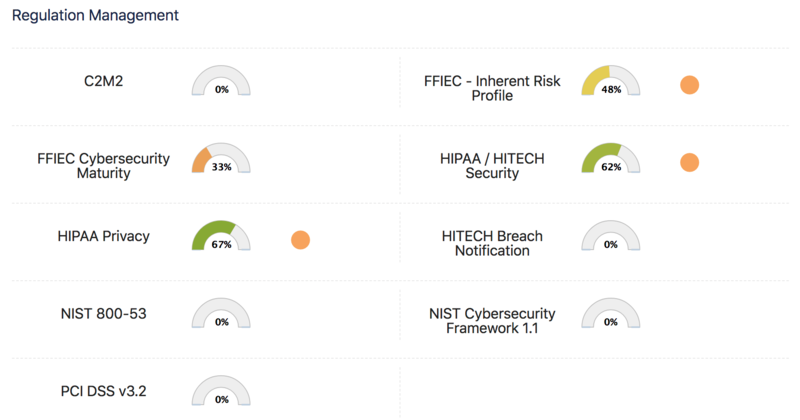 Regulation Management graphs have been refreshed to display the overall Risk and Compliance Level for each active Category within your account. The landing page for Regulation Management has been updated to display all active locations within a Category. Each location graph breaks down overall status of completion, Compliance Level, and Risk Level. To drill down further into these locations, select the location name. In addition to the updated graphs, a new feature was added to the top right section of the Regulation Management landing page entitled, “New Regulation Management.” This new feature allows the user to start managing a new regulation without leaving the page. Lastly, all risk ratable notation sections within each Category have been reformatted. The update should make for a better user experience when documenting the various rule sections of each Category. 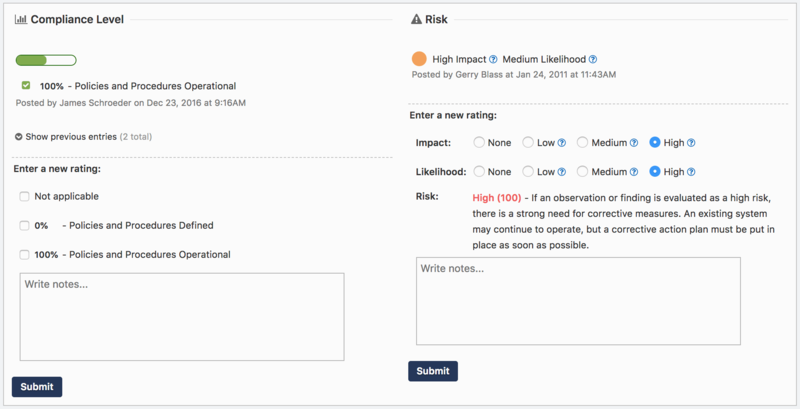 The Risk Management function received several updates before the end of 2018 starting with its name. Since factors other than risk are managed within the function, Risk Management was renamed Regulation Management. Along with the name change, several user interface enhancements were made including, but not limited to, the elimination of Category/Location selection, new graphs to illustrate risk/compliance level and overall Category management progress, and the redesign of Action Buttons within a Category section drilldown. Screenshots are placed below for visual reference. Documents saved throughout the application now have the option to link with multiple Regulation Categories and sub-sections. This enhancement is most easily seen when editing an item from the Documentation function. An Event ID number has been added to all Events within the application. The ID can be seen from the Events dashboard and when selecting an individual Event. ComplyAssistant Mobile’s Instruction Manual is available for your reference by Clicking Here.